Caesar's Palace is a well known resort in Las Vegas that receives millions of visitors a year. 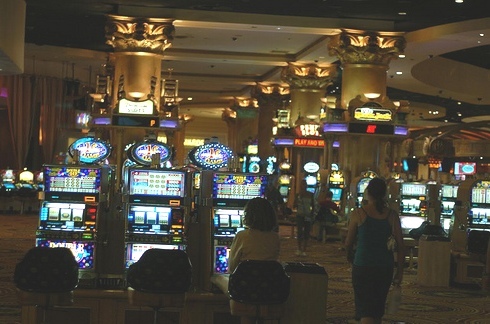 While many people know it because of the extravagance of the accommodations and the excellent production shows it holds on a regular basis, one of the things that you might not know about it is that it has an amazing casino. All of the resorts in Las Vegas (or most of them) have casinos attached, but the one at Caesar's Palace is definitely worth closer inspection just because of how good it is. Just like all of the other great casinos in Las Vegas , Caesar's Palace Casino is located along South Las Vegas Boulevard . This is a region of space that is known in the vernacular as the Las Vegas Strip. It is easily the most famous gambling locale in the world and Caesar's Palace is one of the reasons that the place has become so famous for good quality gambling. This location allows you to game away to your fullest extent while at the same time being close enough to the best eating, drinking and partying in Las Vegas that you could get there at a slow crawl if you needed to. Like all of the excellent casinos in the world today, Caesar's Palace has a complete selection of gaming for you to enjoy. At the top of that selection is their slot machine service. There are hundreds of different slot machines available for you to play at Caesar's Palace with games that start at the conventional one-armed bandit slot machines and go all the way up to the most modern nine reel video slot machine games available. Looking beyond the slot machines, something else that you will see at Caesar's Palace is a lot of table games. That's right, everything from the casino favorites of blackjack and roulette to well known games of baccarat and craps right down to the excellent games of sic bo, three card poker, casino war and others are available at the tables of Caesar's Palace. If you want something that is not traditional casino fare, how about taking a trip over to the keno display and playing a few rounds? Or if keno is not something you generally play, there are also bets that you can place on various events. Bet on your favorite team, your favorite sport or just what happens to be on television next and then sit down to watch what you've bet on with one of the casino's big screen television sets. If the house edge or bookie's juice are not really up your alley at a particular point in time, maybe you would settle for playing against other people instead? With the Caesar's Palace Poker Room you can definitely do that with multiple variants available for you to choose from. There are many extras available from Caesar's Palace such as complimentary drinks and the potential of complimentary food depending on how much you earn through the rewards program they offer.